All the little pigs are in a hurry to go Christmas shopping. However, they discover they have an empty wallet. When angel pig pays them a visit, they soon learn what Christmas is really about. 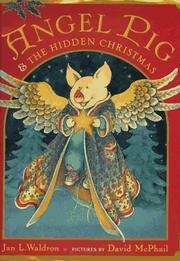 Waldron, Jan, “Angel pig and the hidden christmas,” Children's Picture Book Database at Miami University, accessed April 24, 2019, https://dlp.lib.miamioh.edu/picturebook/items/show/6497.